Spa town and historic centre, Yverdon-les-Bains on Lake Neuchâtel combines culture and relaxation, business and pleasure. 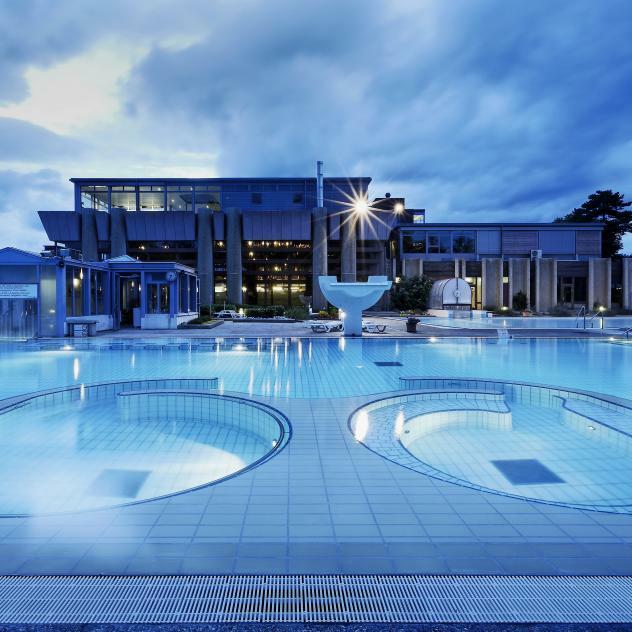 For 1,500 years, Yverdon-les-Bains has been the byword for well-being; relaxation is guaranteed at the Spa Centre with its 29° sulphur springs. With the biggest technology park in Switzerland, Yverdon-les-Bains is also an important business centre hosting many conferences while its pedestrian streets are the perfect place to browse in search of the perfect specialist boutique. The Neolithic menhirs, Roman castrum, mediaeval castle and 18th century buildings are testaments of a long history which is told at the town’s History Museum, while the Maison d’Ailleurs science fiction museum, unique in Europe, projects visitors into an imaginary future. In addition to its historical buildings, Yverdon-les-Bains has an exceptional natural heritage with the Grande Cariçaie, the biggest lakeside nature reserve in Switzerland. Les Jeux du Castrum is an annual festival favouring a contemporary artistic programme by playing with and in an urban setting. The public is encouraged to participate in rich and remarkable encounters in the fields of music, dance, theatre and performances. 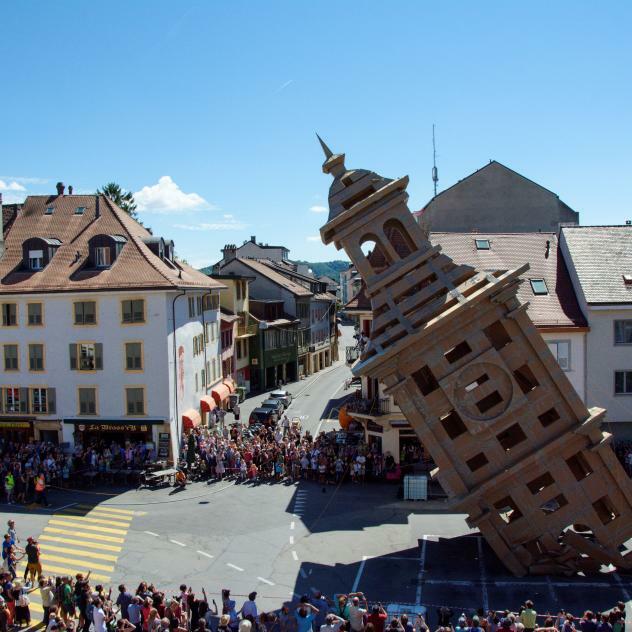 Each summer, some ten free cultural events are held in succession on Pestalozzi Square, in the centre of the old town of Yverdon-les-Bains. The Maison d’Ailleurs science fiction museum is a unique institution, combining an exhibition space and documentation centre. Located in the centre of Yverdon-les-Bains, its exhibits cover themes at the crossroads between popular culture, contemporary art and science. In the first century A.D., a huge castrum protected the port of the roman city of Eburodunum. Now called Yverdon-les-Bains, there are still a few vestiges of the castrum visible in the centre of the city. With the app for smartphone and tablet available, visitors can enjoy an enhanced reality tour of the castrum. Housed in the 18th century town hall Hôtel de Ville, the Yverdon-les-Bains Contemporary Arts Centre (CACY) offers free admission to make art accessible to all. This unique concept in the Lake Geneva Region is a good example of the historical site policy adopted by the town, the recipient of the Wakker Prize in 2009. The church erected in 1757 has a neo-classical façade that rises above Pestalozzi square, in the centre of the old town of Yverdon-les-Bains. The Amalgame concert hall and club with its quality programming, guarantees the visitor will enjoy the discovery of modern music. The only cinema in Yverdon-les-Bains, the Bel Air cinema, makes a point of entertaining a broad audience with quality films and movie premieres. It is situated in the centre of town, a few steps from several restaurants and bars for snacks before and after the screening. Housed in the castle of Yverdon-les-Bains, this theatre is a wonderful creative space and ideal for the presentation of performing arts. Facilities include several pools: non-swimmers and 50 metre as well as a paddling pool and 1, 3 and 5 metre diving boards and a toboggan. The indoor swimming pool has two pools - a 25m pool and a non-swimmer pool. The Y-Plage nautical club offers many stand up paddle courses as well as equipment rental. Named Chef of the Year in GaultMillau 2012, Maryline Nohazic has established the reputation of her restaurant and shares her passion for refined gastronomy with her clients. In summer, her specialities can be enjoyed on a shaded terrace offering a wonderful view on the Lake of Neuchâtel and the Jura. La Prairie, situated in an elegant and refined setting close to the town centre, has long been a favourite meeting place for the inhabitants of Yverdon, It offers the best of local cuisine, generous and seasonal, and is quoted in Gault Millau. A gourmet’s table that enjoys a fine regional reputation and offers varied, authentic and creative cuisine in a friendly setting with a natural and sober style. The various stalls are in centre of the Vieille Ville (‘Old Town’) and provide visitors with an ideal opportunity to explore local flavours and to mill about in the eclectic mix of urban and rural market goers. Every year on the last weekend of June, Yverdon-les-Bains celebrates its lake with the ‘Fête Eau-Lac’ festivities’. This free event with an authentic and convivial character enables visitors to discover a great number of leisure activities offered on Lake Neuchâtel and its shores. Champ-Pittet Castel stands in Yverdon-les-Bains, the gateway to the Grande Cariçaie, Switzerland’s biggest lakeland nature reserve. In this historic house, exhibitions and workshops are held - with a restaurant and rooms that can be hired for organising events in a natural, original environment. Ideally located on the shores of Lake Neuchâtel, three minutes from the station of Yverdon-les-Bains, La Marive is the ideal setting for concerts or other shows. It can accommodate between 50 and 1000 people for private events such as seminars, congresses or banquets. Synonymous with relaxation and vitality, the Grand Hotel des Bains stands adjacent to the renowned spa of Yverdon-les-Bains. A sense of well-being has prevailed here since the eighteenth century. The refined environment is perfect for wellness sessions or business tourism. The youth hostel Le Gîte du Passant is situated in an exceptional and calm setting, close to the town centre, near the shore of the Lake of Neuchâtel and on the river Thièle. Ideal for low budgets, the Gîte du Passant offers excellent value for money. Situated on one of the most attractive sites around the Lake of Neuchâtel in a natural setting, next to the beach and 10 minutes on foot from the centre of Yverdon-les-Bains, the Yverdon Plage**** campsite offers a refreshing change of scene. Furthermore the spa town organises numerous activities and events every summer. The unique formation of the Clendy Menhirs is the most important Neolithic site in Switzerland. Situated on the shores of Lake Neuchâtel, it comprises 45 standing stones that were erected more than 6000 years ago, and are carved with human form. Some are 4.5 metres tall and weigh up to five tonnes. «Numerik Games » is a festival for the general public, devoted to digital art. In Grand Hotel des Bains, La Rotonde Restaurant offers refined cuisine in a warm, gentle and intimate environment. The first indoor trampoline park in French-speaking Switzerland - Jumpark - houses 6 play areas for children and adults alike. Everything here is designed for the pleasure of bouncing: simple trampolines for jumping into foam bins, through to basketball hoops, as well as a slackline. Playing a game of football covered from head to knees in a giant bubble: an activity that promises a good laugh and unforgettable memories. For ages from 5 to 75, everybody will find a bubble suited to their height and shape. A tour in a tuk-tuk is an ideal way for visitors to explore the city of Yverdon-les-Bains in a novel, environmental and fun manner. Nestling on the border of the aerodrome runway, this restaurant offers a plentiful and popular menu with interesting aeronautical-themed decor and a shady terrace outdoors. The Café de la Promenade in Yverdon-les-Bains is the perfect place to savour tasty, small home-made dishes and discover local seasonal specialties. This historical emblem of Yverdon-les-Bains is situated in the pedestrian area of the town centre. The restaurant Don Camillo offers Italian cuisine. Located in the centre of Yverdon-les-Bains, in the historical building of the Benno Besson Theatre, La Grange is a not-to-be-missed venue for Italian gastronomy in Yverdon-les-Bains. Renowned in the Yverdon-les-Bains region and highly appreciated by the residents of Yverdon, this authentic restaurant provides a very warm welcome in a peaceful setting, only 5 minutes from the town centre. Located on the beach of Yverdon-les-Bains, the terrace of the La Plage restaurant is very inviting for guests to enjoy a relaxing break in a peaceful setting on the lakeshore. In a friendly atmosphere, the Csarda restaurant offers a generous menu of traditional cuisine, as well as pizzas. In a rock 'n’ roll atmosphere, the Double R offers the best produce from the Yverdon-les-Bains region in burger form. Le Ranch offers traditional cuisine which can be savoured in a green environment on the lakeshore. The 4 Marronniers restaurant brings Chinese and Japanese specialties to the same table. At the entrance to the Thermal Centre, the Espace Gourmand offers balanced and delicious meals. Located in the town centre, this establishment offers a menu with traditional Chinese dishes and offers excellent value for money. Open from March to October, the Pavillon des Rives in Yverdon-les-Bains offers authentic Indian cuisine to be savoured in a splendid setting on the lakeshore. Open from March to October, the restaurant in the Champ-Pittet Pro Natura Centre offers daily seasonal specials based on regional produce, some of which are picked directly in the establishment’s own garden. In the town centre of Yverdon-les-Bains, Le Seven is a popular meeting place for locals. La Pinte in Yverdon’s pedestrian area is a venue with a friendly atmosphere where guests can savour a cuisine with French and Italian influence. Resto-Lounge du Château on Pestalozzi Square in the heart of Yverdon-les-Bains offers a dynamic and cordial setting. You can choose among Italian and Swiss dishes and enjoy them on the beautiful shaded terrace in summer. Trèfle Gourmand in Yverdon-les-Bains offers quality meals that focus on local and seasonal terroir products. Its beautiful terrace, warm welcome and tasty dishes have earned it an excellent reputation. This leisure venue offers a warm setting for convivial moments with the family, with friends or colleagues. At the St-Rock Café, besides bowling, billiard and video game areas, the snack-bar and lounge area provide plenty of options for enjoyment. Installed in the location that houses the town’s communal oven, which dates back to the 13th Century and was re-discovered in 1979, the bakery honours ancient wheat varieties and local producers. PubliBike offers self-service rental bikes at 7 bicycle stations in different parts of the town of Yverdon-les-Bains. The skate park of Yverdon-les-Bains is one of the biggest in the French part of Switzerland. It is located in the leisure zone of Rives park, on the shores of lake Neuchâtel, 10 minutes from the town centre. Heinrich Pestalozzi (1746-1827) is a Swiss pedagogue, teacher and thinker, pioneer of modern pedagogy. He dedicated his life to teaching poor children. He lived in Yverdon-les-Bains for 20 years. This former hippodrome, which was renowned as Arteplage during Expo02, offers a surface of 20 ha on the shores of Lake Neuchâtel, a 10-minute walk away from the city centre and some hundred metres from the Yverdon-les-Bains campsite. La Ferme, the cozy, friendly shop on the Rue de la Plaine, showcases a large variety of local and regional specialties.